This past August a good friend and I decided to give Kayaking a go. OMG I have fallen in love with kayaking. Kayaking is my new passion. I am super lucky because it is also Holly's! Holly is my camping partner. She also turned her SUV into a sleeping camper. We rented kayaks from Rivers Edge Resort in Wisconsin Dells, WI. Rivers Edge is our favorite place to stay in the Dells! Rooms clean - food tasty and 5 Star Customer Service! The resort is on the Wisconsin River. 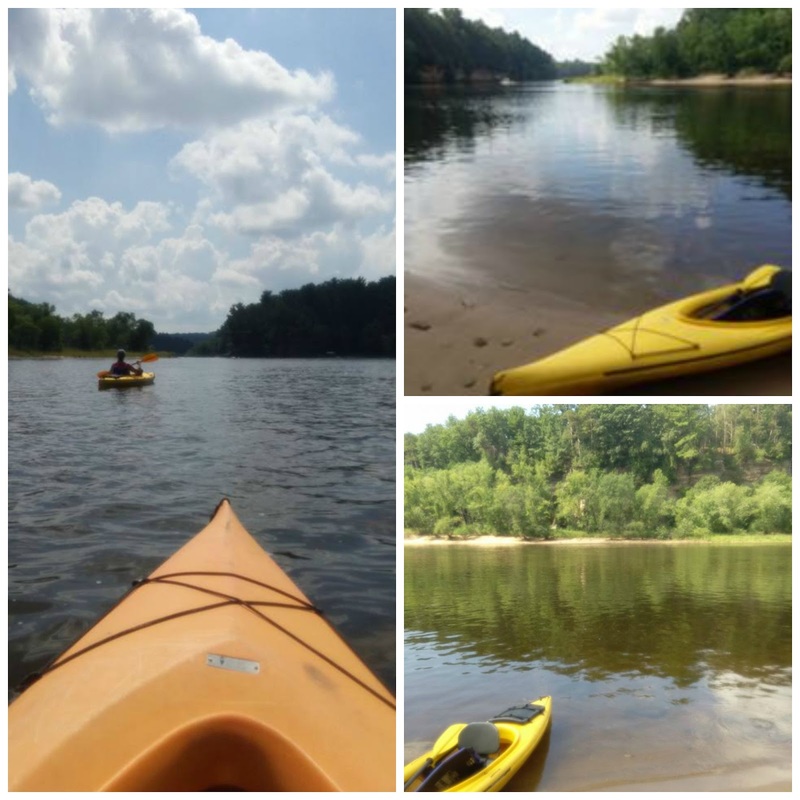 Our first kayaking trip was about 2.5 miles down the Wisconsin River. I don't think I have laughed that hard in years. My favorite statement was "I'm not trying to go this way!" We had a fantastic time! By the end of the trip I was able to paddle in the correct directions! A very successful first trip. Since we had such a good time on our first trip we decided to tackle a 8 mile trip the next day ~ continuing our venture down the Wisconsin River. The 8 mile trip was a handful! The wind was blowing in our face - hard enough to make white caps on the Wisconsin River. We were able to get a few breaks from paddling - a few of the bends in the river got us out of the wind and we were able to let the current take us down the river. We had an amazing time. It was hard but worth every paddle. We were hooked! Kayaking was in our blood!!! This Black Friday I got a great deal on a Explorer 10.4 Kayak at Dunham's. I bought myself a Blue Kayak. I also bought myself a paddle. We plan to make kayak accessory shopping our February activity. Living in Wisconsin with our long cold winters...looking for kayak accessories in February will hopefully break the ho-hum of a long winter. We will be purchasing life vest, dry bags, light, kayak cover and who knows what else. I am very interested in some wet/dry clothing for chiller weather. Wisconsin Spring weather can be very confusing - starts out 85 then within 3 hours it is 65. I will be writing post about the adventure of buying the kayak and the equipment. Make sure to check back. I am also going to buy Diesel a life jacket - I want to get him used to kayaking. He can be our partner in crime while we kayak and camp. Training him to be in a kayak is going to be a WILD RIDE - he is crazy!! I love kayaking so much. I grew up along the Chetco river on the coast of Oregon and learned to kayak both on the river and out in the ocean.